Mr. Brooks weaves stories about enduring and persevering in the entertainment business while raising a family, his most prized accomplishment. His honest and insightful approach elevates audiences and ignites dreamers to action with the highest emphasis on enjoying the life you have now. The unanimous consensus is that after hearing Terron Brooks, there is a realization that dreams are not as far away as anything is possible. Terron Brooks has a passion for inspiring and motivating people from all ages and backgrounds to learn the art of defining success while living a balanced life. A veteran in the entertainment industry, Terron has had the pleasure of performing with many amazing artists, such as Stevie Wonder, Josh Groban, David Foster, Randy Jackson, One Republic, and Smokey Robinson. He has toured internationally with Phil Collins (Going Back Tour) and Matthew Morrison-Opening Act for The New Kids on the Block/Backstreet Boys Tour). 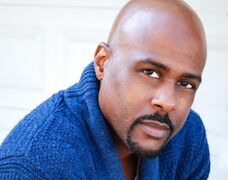 His Broadway credits include Simba in The Lion King and Seaweed in Hairspray. He has been a featured guest artist of prestigious symphony orchestras around the country and is a member of America's Favorite Mashup Group, The Company Men. Click HERE to view and download full bio.